Thermoelectric materials can be employed to develop thermoelectric power generation modules used to convert heat flow into electricity without any moving parts. Increasing the efficiency of these devices is of high interest for application in waste heat recovery and power generation. 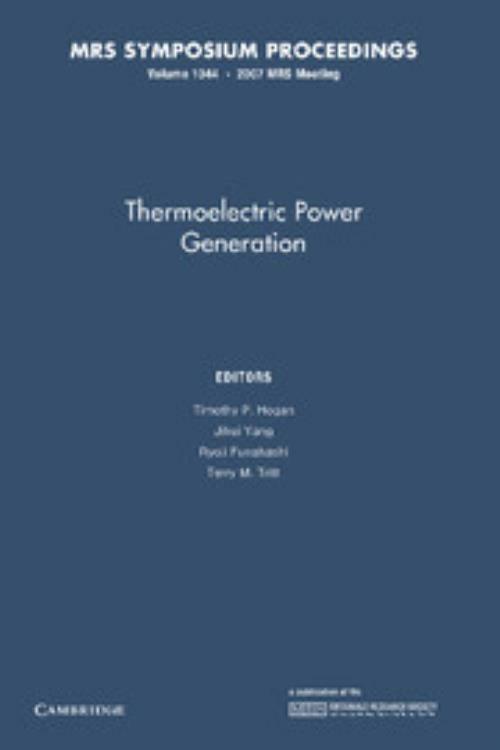 The focus of this book is in the fields of thermoelectrics, thermionics and thermoacoustics for thermal-to-electric energy conversion. It is a challenge to find materials with high electrical conductivity while simultaneously exhibiting high thermopower and low thermal conductivity and promising materials are often brittle so research of these materials is of particular interest. The book provides a concise reference on the current status of thermoelectric materials research and development and emphasizes the multidisciplinary nature - materials science, physics, chemistry and engineering - of the research needed to advance the field. Topics include: nanocomposites; nanocomposites and theory; chalcogenides; bulk thermoelectrics; chalcogenides - thin films and thermionics; thin films and devices; and new and emerging materials and standards. Timothy P. Hogan Michigan State University. Terry M. Tritt Clemson University, South Carolina.